Detailing the physical features, habits, territorial reach and other identifying qualities of the Ten-lined June Beetle. 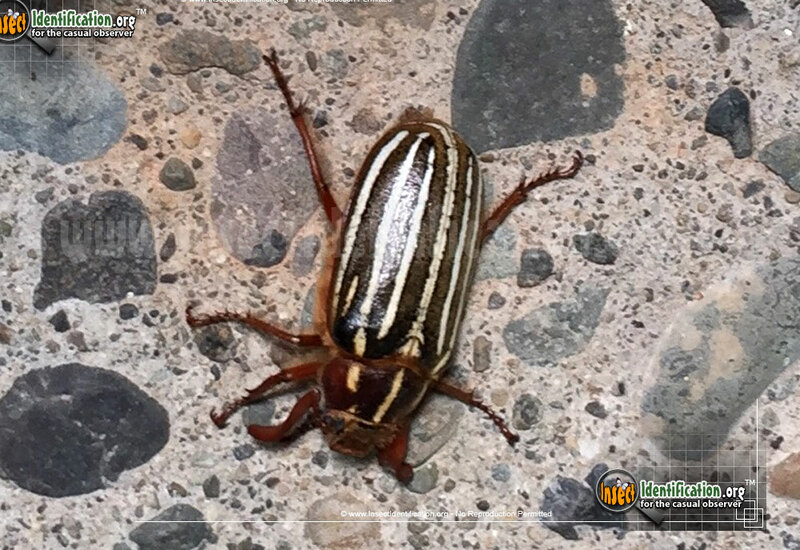 The well-defined Ten-lined June Beetle is a western native that sticks to its roots and even gets a little hissy when disturbed. When counting the white lines on a Ten-lined June Beetle, count the middle line twice because it forms two separate lines once the wings open. The short lines on the sides of the elytra (wing coverings) also count as part of that ten. 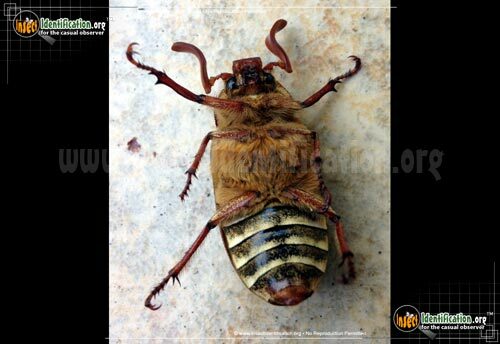 This Scarab Beetle is larger than others and can grow to almost 5cm, or 2 inches in length. Adults are harmless and do not cause any real trouble, but groups of their larvae can kill a tree, or stunt its growth, by devouring the roots. Often, the damage to the tree is unseen until it dies or falls over. These grubs live underground for 2-3 years, feasting on roots, which gives the tree no time to recover season after season. For this reason, the Ten-lined June Beetle is considered an agricultural pest. Ending an infestation is only possible by removing affected trees and those near them (even if they are healthy). The holes where the removed trees were are treated with an insecticide to prevent the next generation of trees from getting attacked. Covering soil with a phosphate-based insecticide between trees when adults are first seen can also help reduce population numbers. Apple trees and other orchard fruit trees are also food sources. When mature, female Ten-lined June Beetles release a pheromone into the air that males find irresistible. Males are also attracted to lights and large groups of them can be trapped by luring them with blacklight traps. Fertilized eggs are laid on the soil and larvae burrow down to find food and protection for winter months. Adults are active from middle to late summer. Adults audibly hiss when moved or disturbed.